One of the most underserved segments of the U.S. workforce is, ironically, the one that serves this country the most—veterans and active duty military. But with less than 7% of the total U.S. population having served in the military, understanding its culture can be challenging—and that’s where PsychArmor steps in. PsychArmor is a non-profit organization that offers free education as well as support for all Americans to engage effectively with the military community. Its mission: bridge the gap between civilian and military life, and to provide an understanding of what the military culture truly embodies. PsychArmor hires experts to teach online courses about issues that are relevant to both the military and veteran communities alike. Emma Plumb, director of 1 Million for Work Flexibility, leads PsychArmor’s new free online course, “Supporting Veterans, Family Members and Wounded Warrior Caregivers with Flexible Work Options.” The course is designed to help people learn about the various types of work flexibility, the benefits of flexible work for both employers and veterans alike, and how managers can implement a flexible work program. Watch the new PsychArmor course on the PsychAmor website or below. 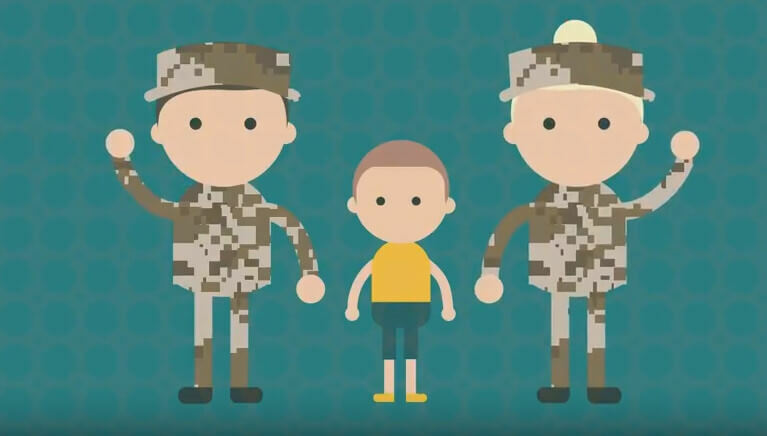 As the video highlights, although flexible work options can benefit everyone, one significant group that needs flexibility is the military, and in particular, veterans, their caregivers, and military spouses. Having military personnel and veterans on staff can be a strategic business move for employers. After all, the military trains people to be responsible, execute orders, show leadership, and focus on being results-oriented. Veterans can work independently (a soft skill important for remote workers), and are proactive about communicating (and problem-solving) any potential issues. From a financial perspective, it can also make good business sense to hire military personnel. The Returning Heroes Tax Credit now provides incentives of up to $5,600 for hiring unemployed veterans, and the Wounded Warriors Tax Credit doubles the existing Work Opportunity Tax Credit for long-term unemployed veterans with service-connected disabilities, to up to $9,600. For military veterans and their families, flexibility may be the best option for them to be able to continue working. If veterans have been wounded, having a telecommuting or remote job means that they can work while still taking care of their health or receiving treatments and therapy. And for caregivers, having a flexible job allows them to work and also better attend to their loved ones. Military spouses can also reap the rewards of flexibility. Sudden deployments and frequent family moves could stop a spouse’s career in its tracks. But with flexible work, military spouses can still work while keeping their family together, without having to sacrifice a paycheck or their professional life. Employers who have been on the fence about adopting flexible work options should consider all of the benefits of flex—both to their employees but also to their organizations. For starters, studies have shown that flexibility builds better workers. Employees who have flexible jobs have proven to be more productive and loyal to their companies. Their engagement level is higher, and they actually tend to work more (not less) than their in-office peers. When employers are planning to add new hires to their companies, having a flexible work policy in place automatically puts them at an advantage. Not only do they get to exponentially increase the talent pool from which to choose, but they can also attract—and retain—workers who are specifically looking for flexible jobs. And then, there are the savings. It’s estimated that for every one telecommuting employee, companies stand to save about $11,000. Plus, with higher retention rates, companies save even more money from reduced employee turnover. Work flexibility can benefit all employers and employees. For veterans, military families, and their caregivers, flex means that they don’t have to choose between career and self-care or caregiving. Plus, with the specialized skill set that many military personnel possess, hiring veterans, their caregivers, and military spouses can be a very smart—and patriotic—decision for employers.